Love foraged and grown food? Then you’ll love Eleven98 Hackney. Eleven98 Hackney run their dining experiences within Hackney Coffee Co which is a large and beautiful space on the famous Hackney Road, full of hanging plants, exposed brickwork and warehouse-style décor. The venue also boasts a garden space at the rear where guests can mingle with their cocktails before taking a seat at the long, communal table amongst an array of arty fixtures. Upon arriving at Eleven98 Hackney guests will enjoy a welcome cocktail before sitting down and indulging on a 6 course carefully curated tasting menu, which is based entirely on Hackney sourced produce. Everything on Eleven98’s menu comes from Hackney, the borough in which chef Aidan Brooks was born and bred. Everything plant-based on his menus has been cultivated or foraged in the borough, and everything else would have been Hackney-produced or sourced. Aidan’s interactive style of service means he’s on hand to offer insightful details behind each dish as its presented, explaining where things were grown or where they came from. This makes the whole experience way more than just a meal. When you dine with Eleven98, you’re literally eating a little piece of Hackney! To find out more about Aidan, Eleven98 Hackney or to book your seat to his next event click here. 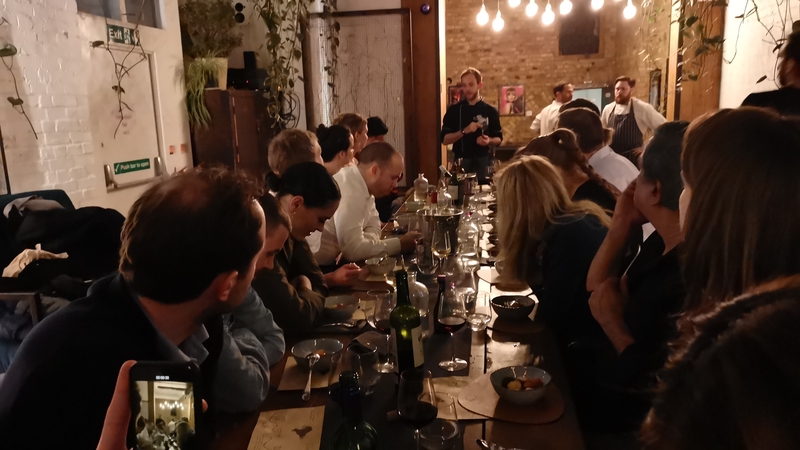 A great social dining experience where food is only made from foraged, grown or locally sourced food from within Hackney. Loved it.